Take a look at this... decadence. Chocolate hazelnut pastries. Tiny apricot morsels wrapped in layers of syrup-crusted butter brushed dough. Triangles of pliant dough filled with chunks of sweet, gooey apple. The bakery is Fornetti's, and it's straight out of Europe, where the company moves more than $100 million in baked goods each year from its more than 8000 locations. These hot, fresh pastries are free of GMO grains. High fructose corn syrup is absent. So what is it doing in Arkansas? And where can you find it? Grav and I attended a preview party this week in the back rooms of Diamond Bear's North Little Rock facility. There, we were treated to samples of different sandwiches on a variety of fresh breads served alongside Diamond Bear Brews (and my own choice, Big Rock Root Beer) while mingling with different people in Arkansas media. Then we were given the news. So, you know the Coulson family, right? Arkansas folks who run a lot of enterprise around here? 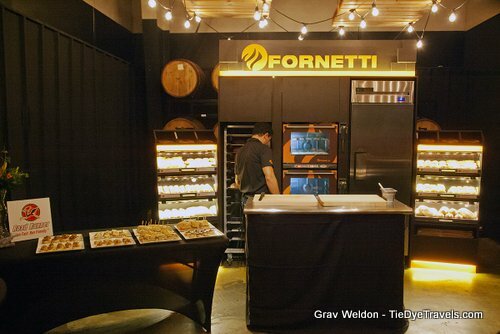 They're teaming up with Fornetti to being European breads and pasties to Arkansas... inside its flagship Road Runner stores. a rush it's not practical. Peters told me the fastest growing retail market in the US eight now is the convenience store. We're used to them for gas and pre-packaged snacks, but Peters says those demands have already changed in Europe, thanks to consumer demand. Folks there want fresh, hot and convenient. registers, so you can pick up a pastry, pay and quickly be on your way. But at a convenience store? Well, sure. Perfect place, actually. 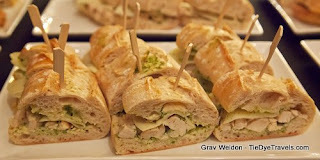 on baguette that interested me for its pliant yet substantial bread, a crusty but soft loaf. I took a baguette home to explore further. This is the sort of bread I would be likely to pick up with a hunk of cheese or dark chocolate for a snack. 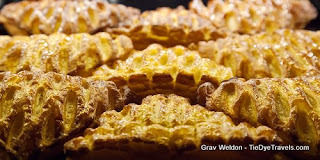 Grav delighted in pretzel buns and started making recommendations foe burgers that could be created on these loaves, because that's what Grav does. 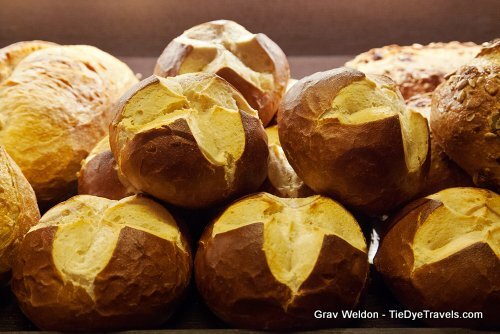 He rather enjoys pretzel buns and rolls when they are done well, and he was especially pleased with these. But it was the dessert pastries that really shone. 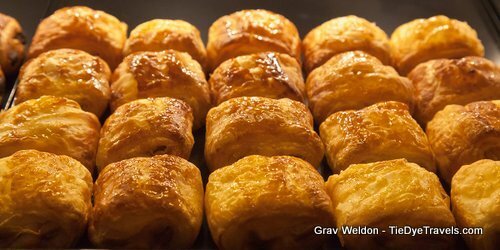 There are these tiny apricot pastries that have a thick apricot jelly within the sweet, crispy hatched crust - they look sort of similar to a product you can find in local grocery stores, but since they're baked fresh they have an entirely different texture to them and they are light and delightful. I loved the little chocolate rolls with their dark chocolate and croissant-like dough - but from reading this you already know how I love a good chocolate croissant. 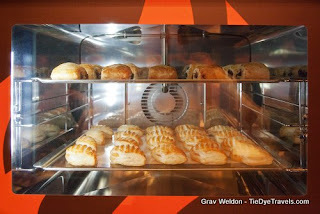 There were these gooey-centered apple turnovers (called Triangles here) that were fall-apart fantastic. Peters told me so far this is the choice of the Arkansas consumer. However, our friends over in Oklahoma (where some Road Runners are also getting Fornetti European Bakeries) seem to prefer the chocolate hazelnut varieties. I can completely understand why. I mean, the Italian-influence of pairing chocolate and hazelnut together is popular, and here it shines. I especially love the almost molten center with its "sparkle" of hazelnut bits. Wow. It'll be interesting to see how Arkansas picks up on this new development. We have long thought of our gas stations and convenience stores as places to pick up a hunk of wrapped cheese or a fried pie by the register, but until now the idea of obtaining fresh and hot baked goods has been foreign. I'm interested to see where this goes. You can find the new Fornetti European Bakery kiosks within Road Runner’s stores at 545 Skyline Drive in Conway; 6320 Rogers Highway in Fort Smith; 1500 Bypass Road in Heber Springs; 3039 Albert Pike Road in Hot Springs; and 800 South Broadway Street, 11401 Cantrell Road and 13400 I-30 in Little Rock. All locations offer a variety of premium bakery products including chocolate and fruit-filled pastries; donuts; artisan breads; and baguettes. Peters said pizzas could also be on the way, so watch for that, too. I worked for the old Road Runner back in college. The cinnamon rolls were good if they were fresh, chicken was edible if the oil was fresh, but the sandwiches were so-so (and I made lots of them). This new concept looks interesting, though, so I am curious to see how it will work out. 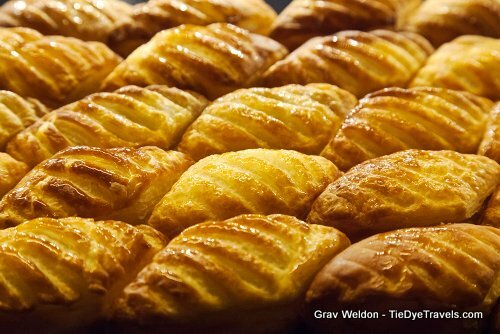 I am currently employed at the Road Runner in Conway and we have these decadent and addictive pastries! 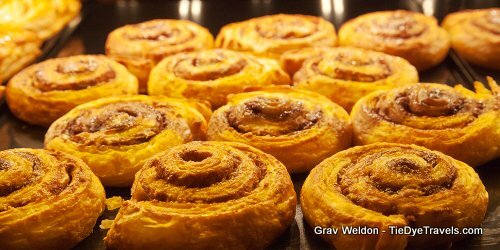 Walking into the store in the morning with the smell of sweet deliciousness makes it hard to resist these tasty pastries! It's good advice. When I was a student, I often had to write custom research paper but instead it I spent much time in the bakery.It was a perfect time!